Darko LazarThe politically correct Pope Francis recently offered his two cents on France’s presidential election. During his flight back to Rome earlier this month, he told reporters that he knew one of the candidates was an extreme far-right conservative, but that he didn’t even know who the other candidate was or “where he came from”. Shortly afterwards, posts started popping up on social media networks, suggesting that the famously astute Jesuit couldn’t possibly be in the dark about Emmanuel Macron. Perhaps the modern and emancipated pope felt that it wasn’t in his best interest to claim that France’s presidential frontrunner came straight from hell, as details about Macron’s backers and associates continued to shock the public. “En Marche” or “Move on”? 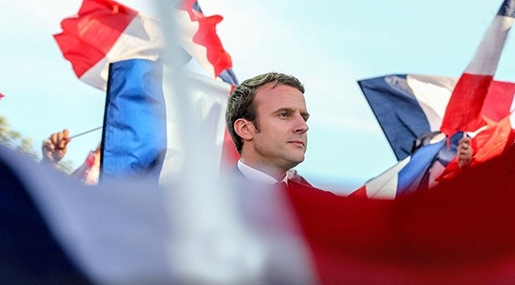 Macron’s team is a reflection of the politics that the centrist candidate propagates – progressive ideas about multicultural societies, globalism, open borders, welcoming more migrants [cheap labor], and of course, a stronger Brussels. His right-hand man, Pierre Bergé, who was ‘married’ to the late fashion icon Yves Saint Laurent and inherited his business empire, finances many of the world’s ‘progressive’ battles, longing for the day when religious occasions like Christmas and Easter will simply be referred to as winter and spring ‘holidays’. Moreover, if statements by Macron guru and Elysée Palace insider Jacques Attali are anything to go by, the French have a rather peculiar future to look forward to. In a 2014 interview with Italy’s La Repubblica, the French economist, philosopher and sociologist painted a picture of a world in which “human reproduction will be the job of machines”, and where a “surrogate mother can be anyone, even a person in the same family”. Meanwhile, the head of Macron’s campaign and media tycoon, Bernard Mourad, served as a virtual guarantee that his candidate would enjoy an unprecedented level of positive media coverage. Mourad, who was born to a Lebanese father and a Moroccan mother of Jewish descent, previously chaired the Altice Media Group, which controls a number of radio and television stations, as well as 60 dailies and magazines, including leading publications like Libération. With the latter in mind, there is nothing particularly groundbreaking about this candidate or his agenda. As a matter of fact, analysts have pointed to the striking similarities between Macron’s ‘political ideals’ and those outlined by George Soros’ Open Society Foundations, including the name of his En Marche party, which appears to be little more than a translation of Soros’ Move On organization. Reports claiming that Macron’s campaign received some 30% of its revenue from Arab monarchies in the Persian Gulf were quickly debunked. The mainstream media could finally claim a victory in the “fake news” war, and justifiably ignore meetings between Macron and members of the Saudi and Qatari royal families. A March 2016 private encounter between Saudi Arabia’s Mohammed bin Nayef and Macron was deemed unworthy of coverage by the mainstream press. Equally ‘uninteresting’ was the news that Macron’s signature during his stint as France’s Minister of Economy and Finance approved the sale of 10 billion euros’ worth of arms to Riyadh. On his watch, in fact, Saudi Arabia became the biggest single destination for French weapons systems. In 2015 alone, French commercial contracts with the Saudis reached a whopping USD 11.5 billion. Macron’s lucrative links to the Qataris were also ignored. The favorite in the race for France’s top job also happens to be a member of a small, informal club of Franco-Qatari investors and patrons. And judging by the perks that the Qatari royal family enjoys in France, the Gulf monarchy certainly falls into the category of “friendly countries”. Aside from purchasing billions of euros worth of trophy assets, ranging from the Champs-Elysees shopping mall to the Lido cabaret, the Qataris have also secured tax breaks in France. The concessions provide the Qatari investors with exemption from taxes on profits made when they eventually put the properties they purchased up for sale. Similar investments, coming from the chief financiers of Daesh [Arabic acronym for “ISIS” / “ISIL”] and al-Qaeda, have helped to radicalize Muslim communities across France, whose young men were used to fill the ranks of militant groups fighting in Syria. As such, one of En Marche’s co-founders, Mohamed Saou, who also enjoys close links to radicals in the Muslim Brotherhood, became an easy target for Le Pen’s campaign. Macron responded in an interview with Beur FM radio, during which he said that Saou “did one or two things that were more… radical…. but he’s a good guy otherwise”. Behind these good guys and slogans of a multicultural world without borders are very dangerous agendas and policies, laying bare the notion that when it comes to foreign policy, there is clearly little divergence between En Marche and the worldview of George Soros and his empire.